Maggie spent the week while we were on our biker vacation happily making friends at the Humane Society of Washington County. They assessed her at the end of her stray holding time, and found that she was friendly, outgoing, resilient (as in nothing rattles her) and very quick to use her mouth. They weren’t sure if she was using it aggressively or not, so were not willing to make her available for adoption immediately at the shelter. I also wanted to explore her alleged crate-soiling behavior, as reported by her previous owner, who said Maggie absolutely refused to eliminate on grass, and would only urinate and defecate in her crate. I can *walk* in grass just fine! 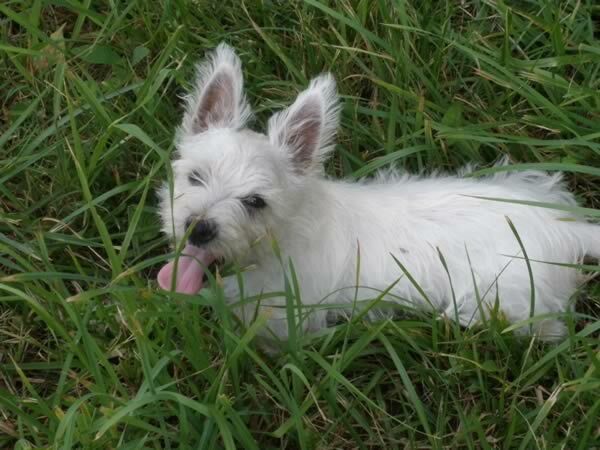 We brought her home to PPaws, where I found her to be a perfectly normal Westie pup. She does, indeed, love to use her mouth, but she just wants to play tug. Correction, she really wants to play tug. Correction, she ferociously wants to play tug. I’m convinced that the previous owner who dumped her here incorrectly identified Maggie’s intense play-growling (while tugging on pants legs) as aggression, and hence applied the inappropriate (inappropriate response even if it was aggression) remedy of grabbing and holding her muzzle closed. Since the previous owner had also received more bad advice (“Don’t ever play tug with your puppy”) and Maggie is dying to tug, the pup’s only outlet for this highly desirable behavior was to grab pants legs, and yes, human hands. Ow! Ow! Ow! Ow! We also worked on teaching her to offer sits and take treats without grabbing flesh. Ouch! Oops! If you grab, the treat disappears! Yes! If you’re polite you can have it! 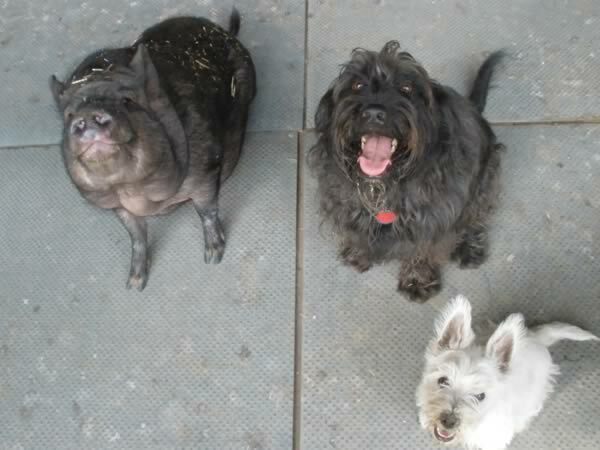 As for the housetraining issue – no worries. She has happily pooped and peed on grass since her first day here. She makes every effort not to soil her ex-pen, has never soiled her crate (we put her food, water and toys in her crate) and pees on the grass as soon as we take her outside. Go figure. Guess what? 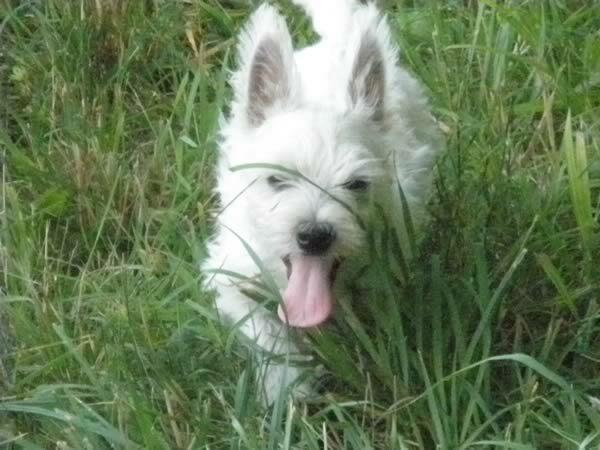 I can poop and pee in grass just fine too! 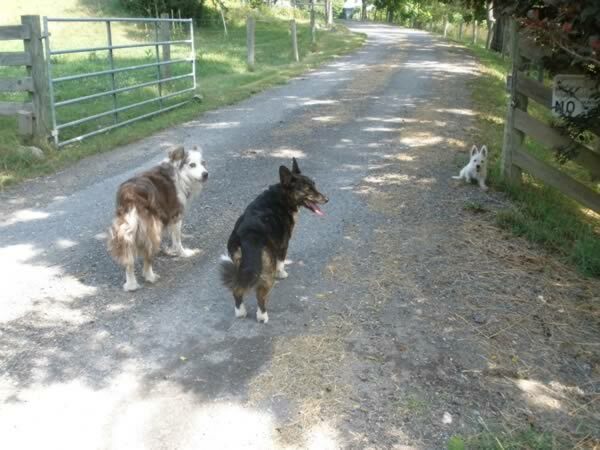 In fact, she’s had a wonderful week hiking around the farm, helping with barn chores with the Miller pack (Scooter hates her) and Sturgis, and soaking up attention from Shirley and all the PPaws apprentices. So – she doesn’t need the Gold Paw program – there’s nothing to fix. They should all be so easy! 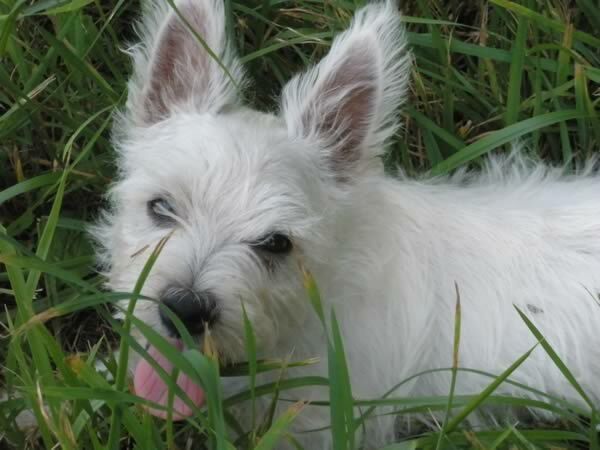 Westie Rescue is coming to pick her up on Saturday, and she will be off to her new life, hopefully in the hands of someone who has a better understanding of normal puppy behavior and can give her the lifelong loving home she deserves. Have a great life, Maggie Faith! 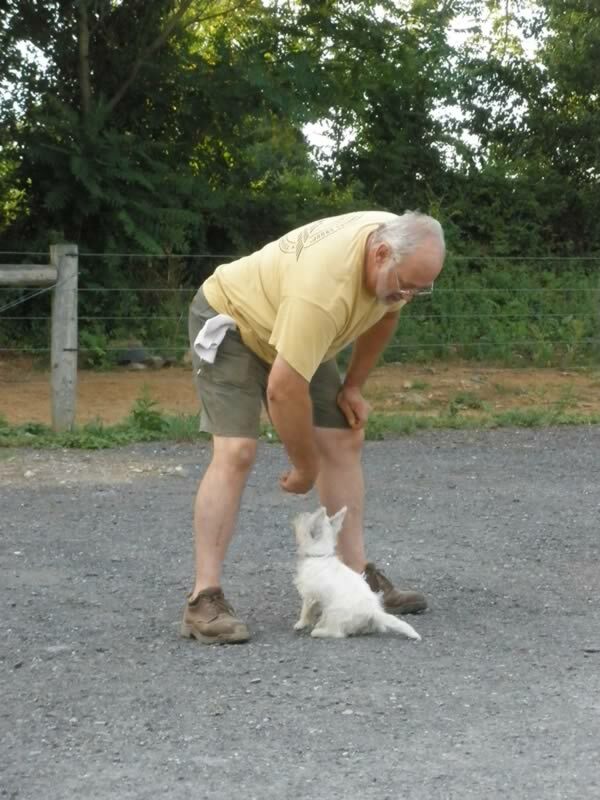 I’m always surprised to hear there are still trainers who think “Tug” is a bad game to play with dogs. My dogs think it’s one of the best! 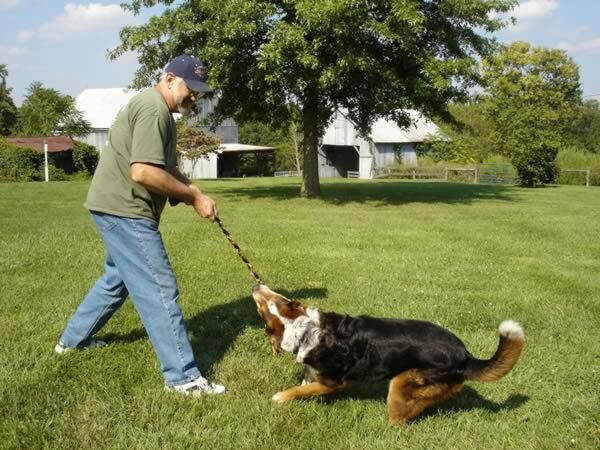 Granted, there may be an occasional dog for whom I wouldn’t recommend it, but as a professional dog trainer and behavior consultant, I often suggest Tug as an appropriate and effective way to help a high-energy, under-exercised dog work off steam. Most of my peers in the positive training world agree. Keep the tug toy put away. Bring it out when you want to play tug. Your relationship with your dog works best when you control the good stuff. Use a toy long enough to keep dog teeth far away from your hands, and comfortable for you to hold when he pulls. Hold up the toy. If your dog lunges for it say “Oops” and quickly hide it behind your back. It’s your toy – he can only grab it when you give him permission. When he’ll remain sitting as you offer the toy, tell him to “Take it!” and encourage him to grab and pull. If he’s reluctant, be gentle until he learns the game. If he’s enthusiastic, go for it! Randomly throughout tug-play, ask him to “Give” and trade him the toy for a yummy treat. After he gives it to you, you can play again (see steps 2 and 3). You should “win” most of the time – that is, you end up with possession of the toy, not your dog. If your dog’s teeth touch your clothing or skin, say “Oops!, Too bad” and put the toy away for a minute. Children should not play tug with your dog unless and until you are confident they can play by the rules. If you do allow children to play tug with your dog, always directly supervise the game. 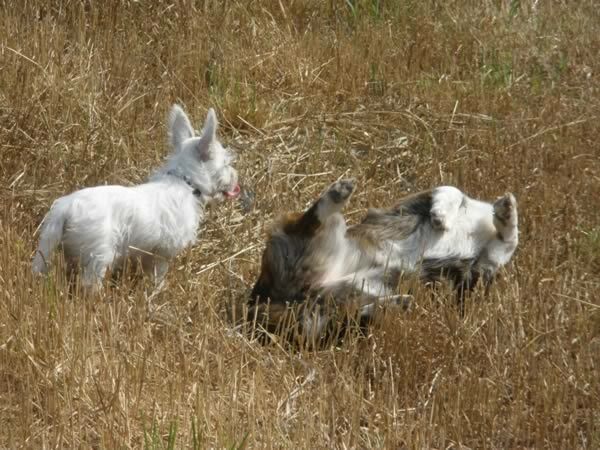 Only tug side-to-side, not up-and-down (up-and-down can cause injury to the spine), and temper the vigor of your play appropriately to the size, age and personality of your dog. You can play Tug lots harder with a 120 adult Rottweiler than you can a Rottie puppy, or a four-pound Chihuahua. When you are done playing, put the toy away until next time. You control the good stuff! What a GREAT story Keep ’em coming! Hey Charlotte, lovely to see you here! 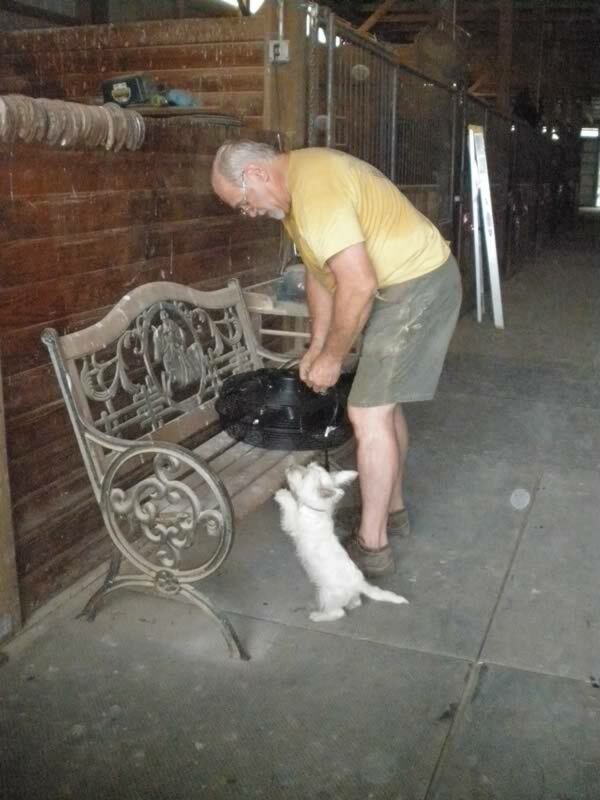 I cannot tell you how much I want Maggie… to have a tug-motivated, confident, outgoing pup in such a CUTE package? Yes please!! I’m quite sure she’ll find a fabulous home somewhere soon. She would be blast to train. 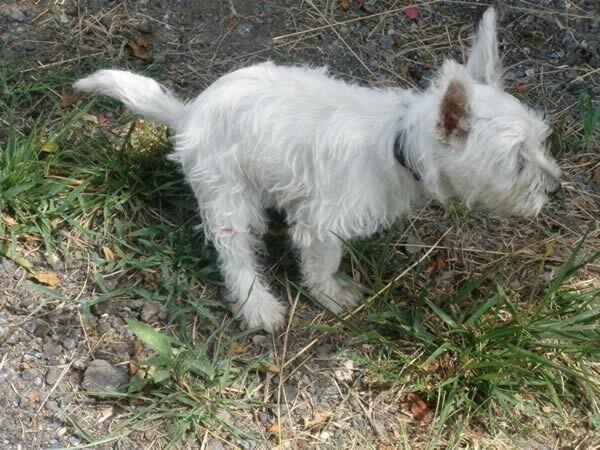 I talked to the Westie Rescue lady and she sounded very good – I trust she’ll find a great home for Mags. And here Cori and I were hoping you’d end up keeping her. She is adorable! Thank you for the follow up, Pat. I love the happy ending to come. Thanks for a simple list of rules for tug. I am constantly having to educate people on the benefits of proper tug. 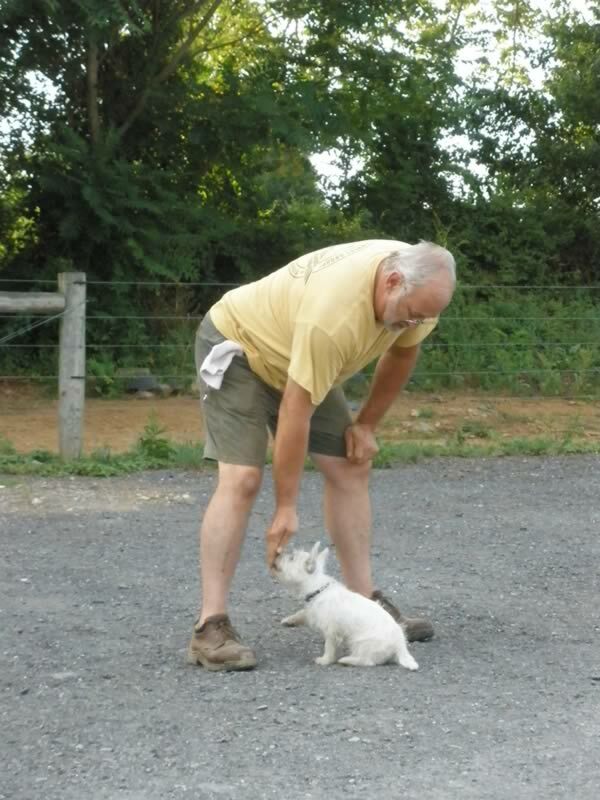 Many of my clients have been taught that tug will: ruin the teeth alignment, create aggression, teach the dog to bite and not let go and many other wonderfully unsubstantiated myths.